If you remember in the 19th century fairy tale Goldilocks and the Three Bears, Goldilocks was looking for the right chair that she could sit on, the right bowl of porridge that she could eat, and the right bed that she could sleep in. If only Goldilocks had guidance that she could refer to. At times we may be like Goldilocks looking for the right educational technology that we can use with our learners for teaching and learning. To assist us in our request to discover the right educational technology, The Education Endowment Foundation (EEF) have released Using Digital Technology to Improve Learning: Guidance Report which provides guidance intended to help both educators and education establishments make the correct choice when introducing Educational Technology into their teaching and learning. The report’s authors drawn upon international research but also consulted with teachers and educational technologists. technology can play a role in improving classroom assessment and feedback. The advice is presented in an accessible format to address the widest possible audience. 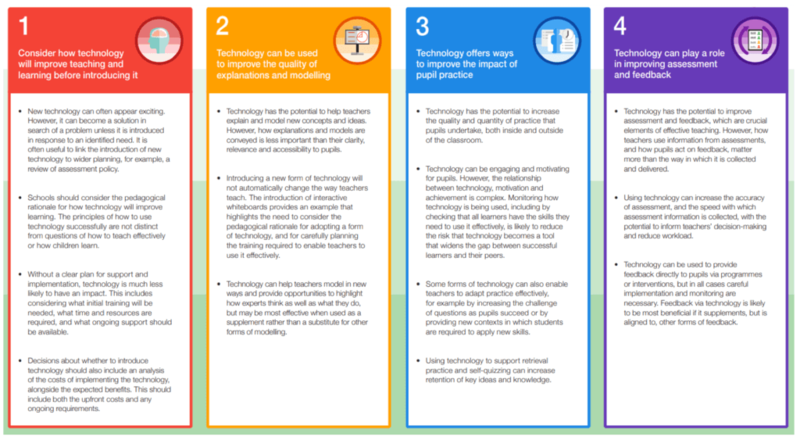 In addition, the report includes several examples of how educational technology can be used in practical ways to either support improving teaching or improve a learner’s learning. So next time you are consider introducing new educational technology to support your teaching and your learner’s learning apply the recommendations of this report to ensure that it is the right technology for the given situation, thus applying the Goldilocks Effect to our choice of educational technology.